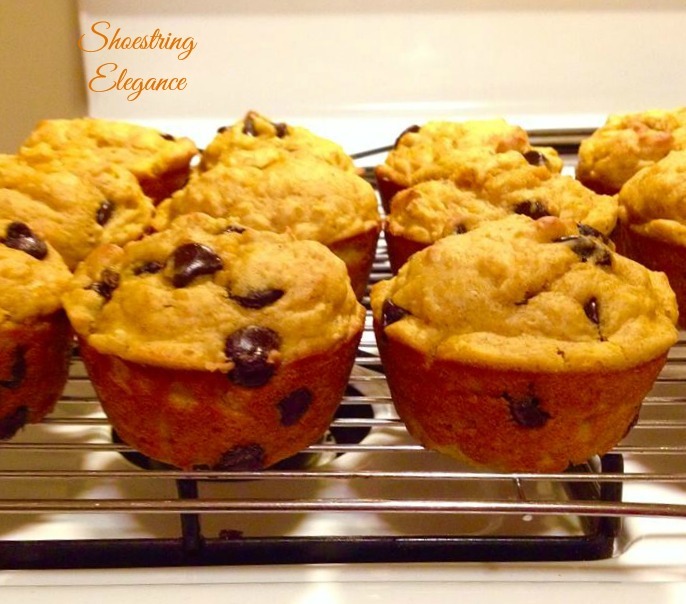 Shoestring Elegance: Best Ever Pumpkin Chocolate Chip Muffins! It's my own recipe, I have tweaked here and there over the years, but it really is quite simple. No appliances necessary, just a wooden spoon and a good, hot oven. I am always trying to find different ways to eliminate the use of oils and fats in recipes, yet still get that rich tasty flavor. This one really does deliver that. 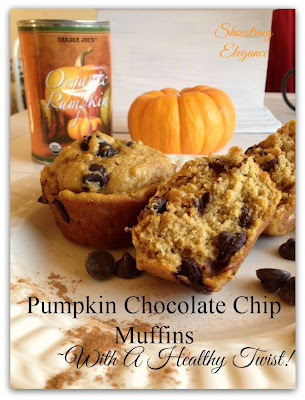 This is a really yummy, fairly light Pumpkin Chocolate Chip Muffin! 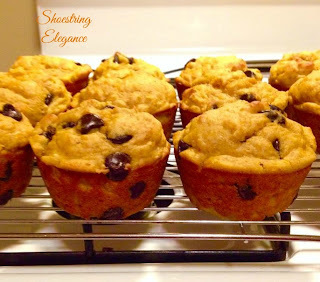 This is a great base for most any good muffin. 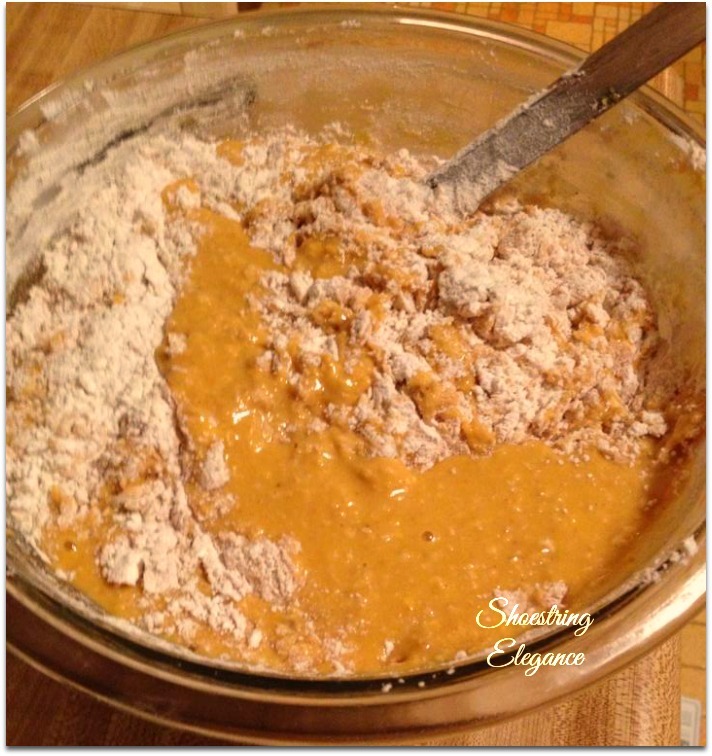 1/2 the flour and low-fat buttermilk. I do tend to embellish it quite a bit. I LOVE Pumpkin everything, almost. I am especially partial to Trader Joe's Organic canned pumpkin puree. Let's just get right down to this recipe! You may think it sounds a little wonky, but I guarantee you-you will love it and so will your friends and family! First of all, bake in a hot oven... Preheat your oven to 400 degrees Fahrenheit or 204 Celsius. 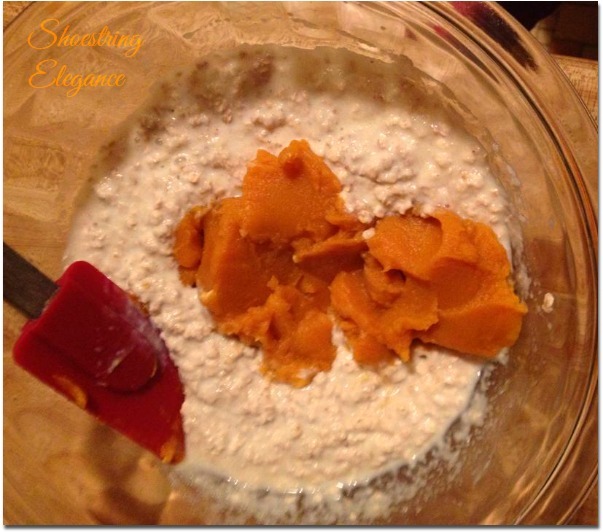 As I stated above: Soak 1 cup of Oats, Quick or Regular, in 1 cup of buttermilk with 1/2 cup of Applesauce. For this Recipe add 1 cup of Pure pumpkin puree, combine well and set aside. In a separate bowl whisk together, not too much, though. just combine. Over a nice size piece of wax paper, in your sifter (if you don't have a sifter you can combine the dry ingredients in a bowl and then I do recommend that you whisk them until combined and aerated. 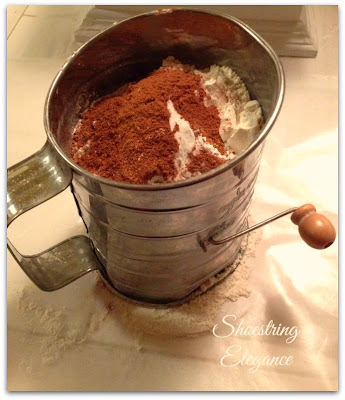 If you don't have any pre-made spice mix, here's a great combination of spices to get you the same flavor combine Cinnamon, Nutmeg, Cloves, and Ginger. Personally, I use more cinnamon and nutmeg then cloves and ginger, because I buy them fresh and in bulk, so the flavors are strong. But, I believe you could do equal portions of each and get a great flavor, just the same. I hope you that you are enjoying a Blessed week! Thanks so much for popping by! More to come soon! These look delicious Theresa! Pinned! Thanks for joining Home Sweet Home! 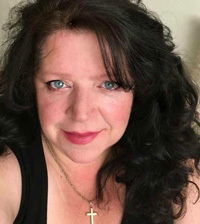 Thank you so much, Sherry! Thanks for hosting! I'm trying to pin this, and all I'm getting when I click anything is-- blank. ? ?